Licensed, bonded and insured we specialize in small to medium home repairs, home remodeling and home maintenance services. Here are some photos of a variety of our work. We take pride in the fact that the majority of our home improvement work comes from referrals and repeat business. See what our happy customers have said for more than a decade. We offer fair prices as well as excellent service and workmanship on all of our home improvements and remodeling. You can always expect us to be prompt, friendly and professional. We want to be your handyman service not just once, but for years to come. We provide home remodeling, home maintenance and home repair services for a variety of clients including home owners and investors. We appreciate your business and welcome your referrals. Just contact us. FIX PHX provide superior home improvement, home remodeling and home repair services to South Scottsdale and Central Phoenix. FIX PHX has been in business since 2004. We have an excellent reputation throughout the valley. 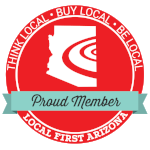 We have an A+ rating with the Better Business Bureau and belong to Local First Arizona, a nonprofit organization that celebrates independent, locally owned businesses. The owner, Eric Bills, is a graduate of Arizona State University College of Fine Arts with a BFA Intermedia. He has an eye for design and detail. "I always knew that Eric would make a terrific handyman from the time when he was 2 years old and starting disassembling & building things at home."